💰Get ‘FREE’ steemies to play by upvoting @moonsteem posts / comments, you need to register with moonsteem first before you do the upvote. After you upvote moonsteem posts / comments, you need to wait about 1min and refresh your game page to see the steemies in your account. You should see the steemies credited by clicking the “faucet” tab. 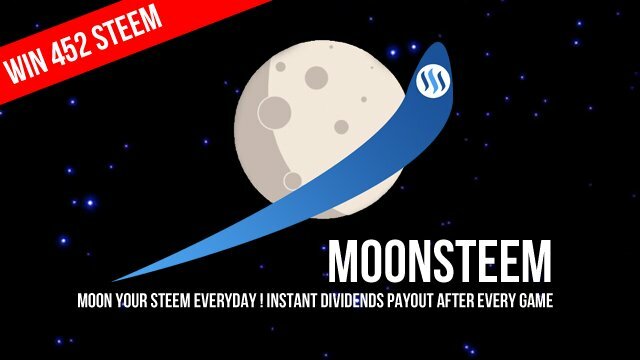 💵 Players Upvote Lottery : WIN a 100% upvote (worth $1.48) from @moonsteem. Players whom wagered more than 1000 steemies (cumulative) of each voting round (every 2.5hr) will automatically stand a chance to win. You can win more than 1 upvote per day. Resteem + Tag and Claim FREE Token ! @msowner1 @msowner2 @moonsteem - game is down..
Oh good, thought my browser was freaking out on me... Yes, the game is down. :( Think it caused me to lose. Its a fun game! Happy to be part of the moon! This game is way too addictive :p I needed to force myself to take a break for a while lol. Dividend payouts from holding some tokens has been good to me :) Keep up the good work! @frafiomatale, @girolamomarotta, @voiceoff, @giornalista, @dexpartacus Try this game!! I love using this game as a pastime after I finish with whatever I'm working on it night. It's rather stimulating.